If Only… April Story | personal.amy-wong.com - A Blog by Amy Wong. In my opinion, Yu’s had a pretty decent 10-year career. She’s been a supporting character more than I would prefer, but who cares, she’s still young and has a long way to go. Here are 5 movies that I wish she could have been in. I believe each film selected would have helped her career in one way or another. Synopsis: A young, shy girl leaves the island of Hokkaido to attend a university in Tokyo. Once there, she is asked to reveal why she wanted to go there in the first place. 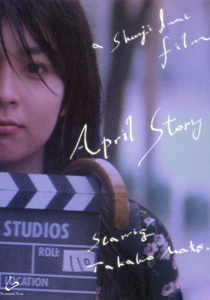 April Story is actually my least favorite Shunji Iwai film, but come on, it’s SHUNJI IWAI! Even though it’s his worst, it’s still good. In my opinion, the film’s downfall lies in the plot, which was too simple, and the running time, which could have been a bit longer. However, April Story does manage to offer some very poignant and heartfelt scenes as well as beautiful cinematography. Anyways, the reason I think Yu would be great for this role is because she plays the shy-type character so well. Look at her portrayal of Hagu in ‘Honey and Clover’, which I feel is pretty similar to the character of Uzuki in April Story. This is actually a film where I believe Yu would turn in a better performance than the original actress. The reason…? YU+Shunji = brilliance! (eg. Hana & Alice / All About Lily Chou Chou) I do think Takako did an okay job, but put Yu in Shunji’s hands and there’s no competition. I also think it’s interesting to point out that Takako Matsu’s actual family was used for the opening scene at the station. If Yu were in April Story instead, who knows, maybe Shunji would have filmed her real family, which would have been very interesting! Hope for Indies in 2010? Does Yu have a family? Obviously she does, but I know nothing about them. I think I agree that April Story is the Shunji Iwai film I liked the least, haven’t seen Undo though. I think you might be right, though we *are* both biased on this, that Yu would have given Uzuki a certain sensibility layer that was missing. Do you recall seeing Yu ever as a proper university student? Not talking about art student… but a proper by the books career. It just strikes me as odd seeing her on that U-Can short doing office work. I wonder if she has that airy aura about her in real life, so she usually gets those quirky characters. Exactly…we don’t know if Yu’s an only child or if she has any siblings, etc. Would have been great to see what the rest of the Aoi clan looks like. BTW, why did she chg her last name to “AOI”? IMDB says her birth name is Yu Natsui. Don’t worry, she’ll probably have a weird haircut for Raiou.